Small Cap Stock - What Does It Mean? What is a "small cap stock"? What is the definition of a "small cap stock"? What does the term "small cap stock" mean? As we discussed in the last dictionary entry, a "micro cap" is considered to be any stock that has a market cap of between $50 to $300 million. A "small cap" stock, by contrast, is any stock that has a market cap of between $300 million and $2 billion. 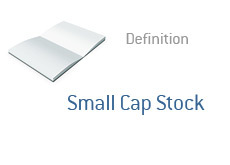 "Small caps" are considered to be less speculative than "micro caps". Small caps tend to be more mature businesses with stronger business ties, better management and larger revenue bases. Small caps will usually also have greater analyst coverage than a micro cap. While many prominent hedge funds will avoid nano or micro cap stocks, many will purchase small caps. For instance, 10.53% of Paulson & Co. Inc's Section 13f holdings are small caps as of December 31st, 2009.